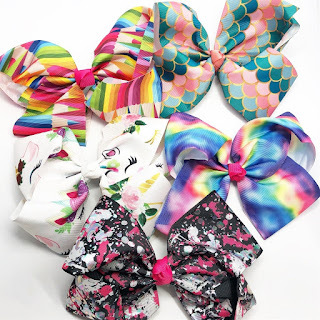 Check out these adorable 6" &amp; 8" Bows | 50 + Styles ONLY $3.99 (Retail $8.99). These bows are the perfect accessory to complete any outfit! These bows come in 2 different sizes and over 50 styles! Styles include many different choices of patterned grosgrain. Each bow has a long high-quality alligator clip to stay secure in hair all day long. With our flat rate shipping, you can stock up on all your favorite styles! $2.99 for the first item and free for each additional item. US only. Seller usually ships within 5 business days. Ships no later than Sun, Jul 22.